Rainy Days…Rainy Nights…Will Charleston, SC EVER See Sunshine Again? As I glance outside at the window by my desk, I see gray skies…Raindrops are dripping slowly to the ground. Trees are covered with so much moisture, they almost lose their color. The mimosa trees drip with a grayish color as if to say they are sick and tired of this rain and don’t want to see or feel anymore! Pine trees are leaning over a bit. These pine trees are the seeds I planted after Hurricane Hugo, so the two that grew are just a bit special for me. My husband gripes about them always saying he plans to cut them down. Pine trees are reminiscent to me, reminding me of my childhood in Georgia. How frightened I would become while laying on the grass, noting their height and strength. I always feared those pine trees might pop and fall on top of me. Nevertheless, pine trees are prevalent in Georgia. I remind my grumpy husband that we lost five trees in our yard after Hurricane Hugo. Again, he grunts knowing that IF he cuts those trees down, he will have to deal with me – an unhappy woman sad that her little children of trees are gone due to his selfishness. We have three mimosa trees in the back yard now – planted from seeds from the hands of Mother Nature. How I love those mimosa trees, although today the branches are leaning down. Perhaps they weigh a bit too much now from all of this monsoon rain. Perhaps later, I will slide my rain boots on and walk outside, just to touch the tree branches I’ve watched growing from a tiny seedling to the height of 20′ – maybe a bit less. I’m much too short to measure them! I want those precious trees soaked and probably curious from the hands and moisture of Mother Sunshine to understand I still love them, and I want them to flourish. All in time. I am hopeful this monsoon rain will end soon…and just when I think I might see a bit of relief, I glance outside again to see sheets of rain. My yards are so wet I would not dare to walk outside in my stiletto or pump high heels. No doubt if I made the attempt, my feet would stick in the sandy moisture and pull me downwards. I don’t want to get soaked or dirty. I have a thing about dirt under my nails, but enough about that. Last week, the rains began – at least I think it was last week. 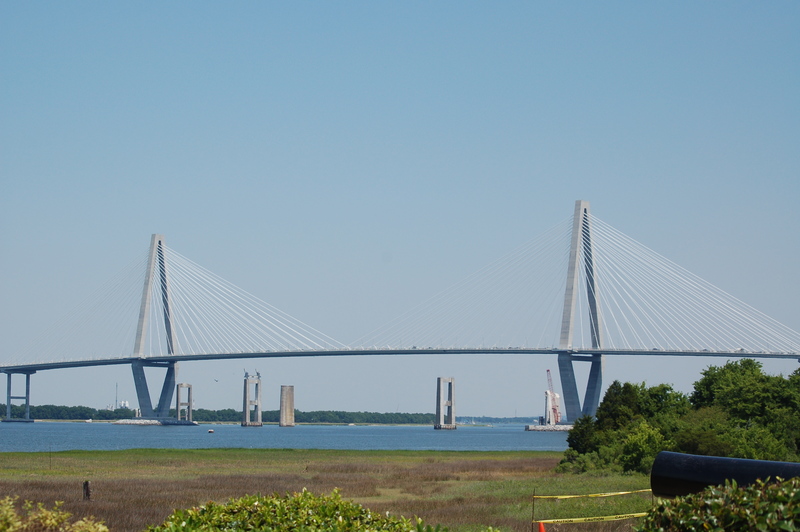 On Wednesday, Tammy, Sara, Chris and I walked the Arthur Ravenel, Jr. Bridge. It was a humid, gray morning with only a slight breath of wind. Walking up the first incline, I struggled with my breath, stopping several times to use my inhaler. I encouraged the girls to go ahead. I stopped several times, just to catch my breath. I counted the lamp posts, telling myself that If I made it to the last lamppost at the first twin towers, I would rest, and I did. Still, I pushed myself, anticipating the approaching rains. I am proud to say, I accomplished my walk – but it appeared to take me forever. Thank you so much, silly asthma. How I wish I did not have asthma, although it is something I have battled all of my life. For me, there is something magical I feel while walking the bridge. While walking — sometimes it appears I am crawling, up the first incline, I feel as if God is pushing me, guiding me, telling me – take just one more step. You can do this! And so I do. I believe it doesn’t matter how long it takes. All that does matter is I am taking baby steps to my health. I am accomplishing something I’ve always said I would do “One Day,” after the bridge opened in 2005. I see walkers, runners, bikers, strollers, and I’ve seen a few walkers walking dogs (you do realize dogs are not permitted on the bridge – don’t you?) On one morning, a dog left a calling card. I missed stepping on it by just a few baby steps. Honestly, some people love to break the rules, don’t they! I suppose you could say I believe in breaking rules – sometimes; however, I am considerate of others. I do not take my dogs on my walk. Accomplishing that bridge walk is something I take extremely seriously. I don’t want interruptions. Now that we have about three to five women walking with us, we all move at our pace. We don’t compete. We encourage, and If one of us gets behind like “slow poke Barbie” a nickname I’ve given myself — we text to make certain all is ok. These women are the greatest! Did I mention one of them is a high school friend from — let’s say — a few years ago in another town? Her name is Melanie. In high school, we were not close friends, and that is all my fault. When I was in high school, the only thing I wanted was to graduate and leave my childhood home. I failed to make close friends, only wanting to get out of Bibb City and the traumas of my youth. Now, a different place. A different time. A different woman. I am proud of the woman I have grown into in my adult life. Gone is the wallflower. Gone is the child afraid to speak up. Replaced by someone who speaks her mind, believes in herself and is proud for the small accomplishments I have achieved. Finally, I can smile, look in the mirror and say, “Hey woman…You’ve got this! You is smart. You is determined, and you Is a better person for breaking that mold!” Thank you, God! So today, I suppose is a day to reminisce…to ease the gloominess of all of this rain. A day to erase all of the past, or should I say — a day to WASH the past away! Glancing out my window again, the rain has stopped. I am confident it will start again. I’ve lost count as to how much rain we’ve had, but I imagine it is close to 15 inches, possibly more. I imagine the mosquitoes will be increasing now, along with the disgusting mold, mildew and ragweed. Wouldn’t it be nice IF the ragweed was washed away. I think I’m looking forward to a day where I awaken to the sunshine peeping thru the windows. I am so sick of all of this rain. It is time for all of us to smell the flowers…inhale the scent of fresh rain…and to move on with our lives.